SINGAPORE - The Philippines found another hero in Mac Belo as it survived a gripping finale against Indonesia, 72-64, to retain the basketball gold medal in the 28th Southeast Asian Games. Belo scored 22 points and time and again kept the heads of the Gilas cadets above water in a game played before a predominantly pro-Filipino crowd at the OCBC Arena that didn't breathe easy until the final seconds. The victory gave the Philippines its 17th basketball gold medal in the SEA Games, where it has reigned supreme in all but the 1989 edition in Kuala Lumpur. No basketball competition was held back in 2005 when host Philippines was under suspension from world basketball body Fiba. However, the gap between the Philippines and its regional rivals is fast closing. Just a day after having to survive a tough stand by Thailand in an 80-75 semifinal victory, Tab Baldwin's cadets were again made to sweat by an Indonesian side toughened by stints in the Asean Basketball League (ABL). The Indonesians lost to the Gilas cadets by 56 points in the Seaba tournament and by 29 in their preliminary meeting here. This time they battled back from 18 points down to stay within three points going to the final stretch. Skipper Kiefer Ravena also made a big play late, intercepting a crosscourt pass by Indonesia and scoring on a layup that eased the pressure on Gilas, 61-56, with 4:31 left. A visibly relieved Baldwin was given the traditional victory ride later and doused with water by Filipino players, most of whom played in this biennial showpiece for the first time. “It’s obvious there is a lot of love between this basketball team and coaching staff. We worked hard,” said Baldwin. The gold medal was also the 29th overall for Team Philippines, sparing the 700-strong contingent the ignominy of falling below its 29-gold output in the 2013 Games in Myanmar. 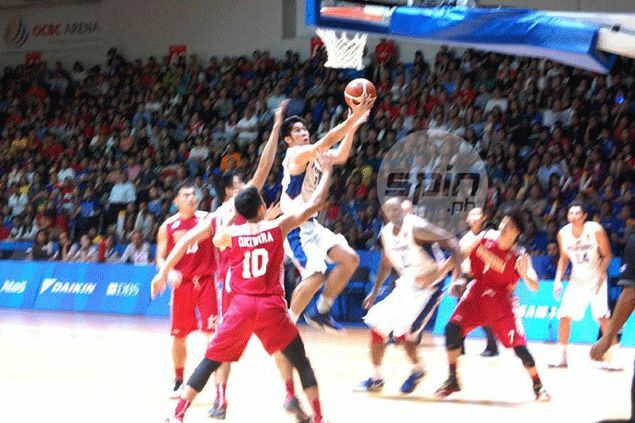 Ravena finished with 12 points as he clinched his third SEA Games gold medal. Troy Rosario added 11 points to make up for another lackluster showing by Marcu Douthit, who finished with three points. Philippines (72) — Belo 22, Ravena 12, Rosario 11, Ferrer 6, Thompson 5, Vosotros 5, Amer 4, Douthit 3, Jalalon 2, Khobuntin 1, Torres 1, Rivero 0. Indonesia (64) — Kurnaiwan 16, Sitepu 11, Wisnu 10, Gunawan 8, Wuysang 7, Enguio 7, Putra 3, Indrawan 2, Santosa 0, Sanjaya 0, Dhyaksa 0. Quarterscores: 22-15, 39-26, 58-47, 72-64.